The company that was to become Garrard was founded by George Wickes (1698–1761), who entered his mark in Goldsmiths' Hall in 1722. Wickes set up business in Threadneedle Street in the City of London in 1722; the company moved to Panton Street off Haymarket in central London in 1735 as a goldsmith and provider of jewellery and other luxury items to aristocratic patrons. Wickes was an accomplished silversmith known for his work in the rococo style, and gained the patronage of Frederick, Prince of Wales. Two apprentices of Wickes, John Parker and Edward Wakelin, purchased the company following Wickes' retirement in 1760, replaced by John Wakelin and William Taylor in 1776. Following the death of William Taylor, Robert Garrard became a partner in the company in 1792. Garrard took sole control of the firm in 1802, with his sons Robert Garrard II, James and Sebastian succeeding him in running the company, trading as R., J., & S. Garrard (or Robert Garrard & Brothers) until James' retirement in 1835, when the company became R & S Garrard. The company remained in the hands of the Garrard family until the death of Sebastian Henry Garrard, great-grandson of Robert Garrard senior, in 1946. The name Garrard & Company Ltd was registered in 1909, and the company moved to new premises in Albemarle Street in central London in 1911. In 1843, Queen Victoria appointed Garrard as the first ever official Crown Jewellers, leading to the production of numerous pieces of silverware and jewellery for the Royal Family, as well as the upkeep of the Crown Jewels. The company has dealt with a number of famous jewels, such as the Cullinan diamonds (including Cullinan I, "The Great Star of Africa"), and created such pieces as the Imperial Crown of India in 1911, the crown of Queen Mary for her coronation, and the Crown of Queen Elizabeth in 1937. In 1852, Garrard were given the responsibility of re-cutting the famous Koh-i-Noor diamond into a brilliant. In 1848 Garrard produced what is now referred to as the America's Cup, and is the oldest international sporting trophy. The Cup is an ornate sterling silver bottomless ewer originally awarded in 1851 by the Royal Yacht Squadron for a yacht race around the Isle of Wight in England, which was won by the schooner America. The trophy was renamed the 'America's Cup' after the yacht and was donated to the New York Yacht Club under the terms of the Deed of Gift, which made the cup available for perpetual international competition. Garrard amalgamated with The Goldsmiths and Silversmiths Company in 1952, when they closed their Albemarle workshops and moved premises to Regent Street. Garrard merged with the jewellery firm Asprey in 1998 to become Asprey & Garrard, moving from 112 Regent Street to premises on New Bond Street. The company demerged in 2002, with Garrard returning to the Albemarle Street site it first occupied in 1911. Garrard was acquired by the US private equity firm Yucaipa Companies in 2006, ending its partnership with Asprey. Jade Jagger was the creative director for the company from 2001 until being replaced by Stephen Webster in 2006. In 2012 Sara Prentice was appointed Creative Director of the brand. On 15 July 2007, an announcement was made in the Court Circular, under Buckingham Palace, that Garrard & Co's services as crown jeweller were no longer required, with the reason cited being that it was simply 'time for a change' . This ended 166 years of Garrard's tenure as the inaugural British Royal Jeweller, although Garrard still holds a royal warrant from her son, the Prince of Wales. More recently, Garrard has been noted as being the maker of the sapphire engagement ring given by Charles, Prince of Wales, to Diana, Princess of Wales for their 1981 marriage. After the Death of Diana, Princess of Wales, the ring passed to her sons, and in 2011 it returned to the public eye as the engagement ring Prince William, Duke of Cambridge gave to his wife Catherine. The distinctive cluster setting of this ring has become a signature of the House, and is still seen in the designs of the 1735 collection today. Garrard has created many other jewels that are worn by the British royal family, including the Girls of Great Britain and Ireland tiara which Queen Elizabeth II is seen wearing in the portrait featured on British currency. The Queen Mary Diamond Bandeau worn by Meghan Markle on the occasion of her marriage to HRH Prince Harry was created during Garrard’s time as crown jeweller. Garrard created the Premier League trophy, and produced the original prop of the Heart Of The Ocean for Titanic. In 2018 The House of Garrard continued its rich legacy of sapphire jewellery creations with the unveiling of a 118.88ct royal blue Burmese sapphire presented in a brooch that features the House’s signature cluster setting. 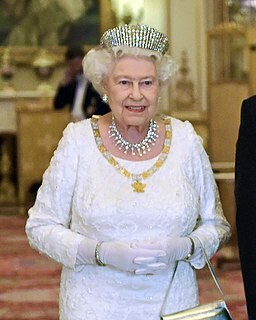 The jewel was named in honour of the 65th anniversary of Queen Elizabeth II’s coronation, a date traditionally marked by the gift of a sapphire, and pays tribute to the House’s role in remodelling the Imperial State Crown for the occasion. Gere, C., Culme, J., and Summers, W. (1994). Garrard: The Crown Jewellers for 150 Years. London: Quartet Books. ISBN 0-7043-7055-7. Noon, Chris. "Billionaire Burkle Buys U.K. Crown Jeweller" Forbes, 21 March 2006, retrieved 21 November 2006. ^ "Ascot". www.ascot.co.uk. Retrieved 2018-07-26. ^ "About America's Cup". Sir Peter Blake Trust. 2 August 2014. Archived from the original on 11 December 2015. ^ DE ROSEE, SOPHIE (10 January 2012). "World of: Jade Jagger, designer". Daily Telegraph. Retrieved 31 July 2016. ^ "Garrard to lose Royal Jeweller role". 2007-02-10. Retrieved 2016-07-31. ^ "Garrard to lose Royal Jeweller role". Retrieved 2016-07-31. ^ "Royal Warrant Holders Association – Garrard & Co Ltd". Royal Warrant Holders Association. Retrieved 16 May 2011. ^ ; David Wilkes; Fay Schlesinger (November 2010). "A ring fit for his mother... and his love: Prince William's sapphire and diamond engagement ring for Kate". Daily Mail. Retrieved 16 May 2011. ^ "See Meghan Markle's Sparkly Royal Wedding Tiara". Cosmopolitan. 2018-05-19. Retrieved 2018-07-26. ^ "House Of Garrard Creates 118 Carat Sapphire To Mark Queen Elizabeth's 65th Jubilee". Harper's BAZAAR Arabia. Retrieved 2018-07-26. Wikimedia Commons has media related to Garrard & Co.
Queen Silvia of Sweden is the spouse of King Carl XVI Gustaf and mother of the heir apparent to the throne, Crown Princess Victoria. In 2011, Silvia became the longest-serving queen of Sweden, a record previously held by Sophia of Nassau. Boucheron is a French luxury jewellery and watches house located in Paris, 26 Place Vendôme, owned by Kering. Asprey International Limited, formerly Asprey & Garrard Limited, is a United Kingdom-based designer, manufacturer and retailer of jewellery, silverware, home goods, leather goods, timepieces and a retailer of books. Marie-Étienne Nitot was a French jeweller, the official jeweller to the Emperor Napoleon, and the founder of the House of Chaumet. Mappin & Webb is a jewellery company headquartered in the United Kingdom. Mappin & Webb traces its origins to a silver workshop founded in 1775. It now has retail stores in the UK. It has held Royal Warrants to British monarchs since 1897. The company's master craftsman Martin Swift is the current Crown Jeweller of the United Kingdom. The House of Bolin is one of the oldest firms specialising in jewellery and silverware that remains in the hands of its founding family. The firm exists today as Jewellers and Silversmiths to HM King Carl XVI Gustav. The wedding of Princess Anne and Mark Phillips took place on Wednesday, 14 November 1973 at Westminster Abbey in London. Princess Anne is the only daughter and second child of Queen Elizabeth II and Prince Philip, Duke of Edinburgh, while Mark Phillips is a skilled horseman and equestrian. 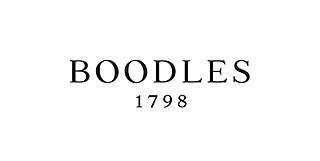 Boodles is a privately held British luxury jeweller and jewellery designer group founded in 1798. Boodles is family company located in Liverpool, it also has stores in London, Manchester, Dublin and Chester. Their flagship store is found on New Bond Street, London. David Morris is a British luxury jeweller famed for designing, crafting and selling fine jewellery and watches. It was founded in 1962 by David Morris and remains family owned. Throughout its 50-year history David Morris has produced a number of notable works, including the Miss World crown, jewellery for the James Bond film franchise and various pieces commissioned by royal families.